I play guitar for my church. The core of my rig is a Boss GT6, but I've found it impossible to have a solid clean tone without the dirty tones just blasting it for volume, so I have a board with a compressor, Washburn Soloist distortion, DigiTech Bad Monkey, EHX LPB-1 clean boost, EHX Signal Pad attenuator, Danelectro Cool Cat tremolo, and Morley Little Alligator volume pedal, which I connect into the input of the GT6. The pedals are connected mostly with the kind of cables in a jar next to the cash register at Guitar Center. I power the board with a Visual Sound 1Spot, and normally, it's been no problem. 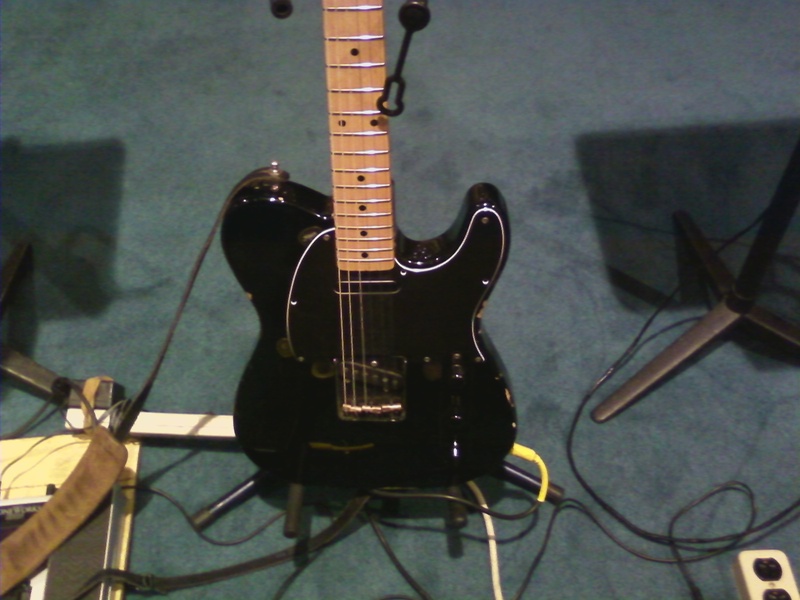 Signal starts with my #1, a mid-80s Telecaster I added a four-way switch to, which is my #1 guitar. Yesterday, toward the end of service, I noticed a small buzz coming out of my system. 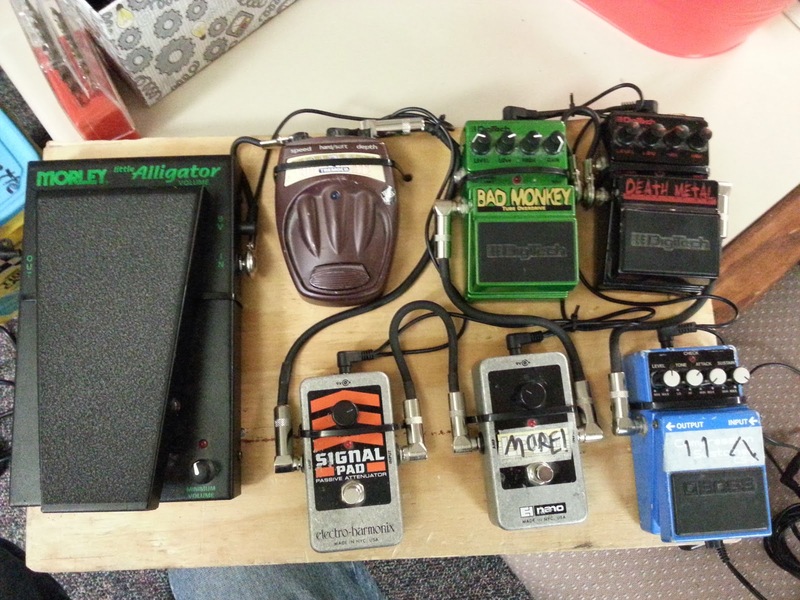 I nudged some pedals and got a big buzz. I used the volume pedals to drop the volume and tried to figure out where the buzz was coming from. After service, I poked and found that switching out the cable connecting the board to the GT6 caused the buzz to go away, and switching in two longer cables brought the buzz back. with the dirt pedals in the front row. Yesterday evening, setting up to play again, I simplified to just Tele -> GT6 -> DI, and immediately got all the buzz in the world, and found that, by turning down the volume on the guitar, I could change the pitch of the buzz. I expected either 1) nothing would happen, showing the problem was in the pedalboard, or 2) the volume would go down, showing the problem was with the instrument or involved the single-coil hum. What I got surprised me and I could base no diagnosis on it. I was handed a loaner guitar and the issues went away. This morning, I plugged my #1 into my amp at home and it sounded just like I'd expect. I honestly have only the slightest idea as to what went on. I've had problems at that venue before, and the problems I've had with buzz there, I've had nowhere else. Then again, I'm normally either into the DI at church or my amp at home (or elsewhere). I'm in a confused state on the issue, and will have to plug things in and try things out to try to solve things. Any comments or suggestions? Walking Bass for "Without God"
This is Robert Randolph from the album Sacred Steel Vol 2: Live! This is before Family Band, before playing with Clapton at Crossroads. My favorite version of this is from the album The Word, which was Robert playing with the North Mississippi All-Stars and John Medeski on organ, where they just pump on this jam for seven minutes. Get the album. I could play it for a long time before I got what was going on there. What's going on is, it outlines an F chord, starting with the octave, dropping to the major third (A), then climbing chromatically through the fourth (Bb), flat fifth (B), perfect fifth (C), jumping to the major sixth (D), minor seventh (Eb), major seventh (E) and back up to F. I hadn't really broken up what else was going on, so in my mind, I was categorizing it as being about the A chord, not the F chord.